If you’ve ever attempted online dating–or really, even filled out your Facebook profile–you know how agonizing it can be to figure out exactly what information about yourself you want to include. How can you quantify, in writing, how you want the rest of the world to see you? That’s the question that the artist R. Luke DuBois aims to answer in his series of graphics, A More Perfect Union. 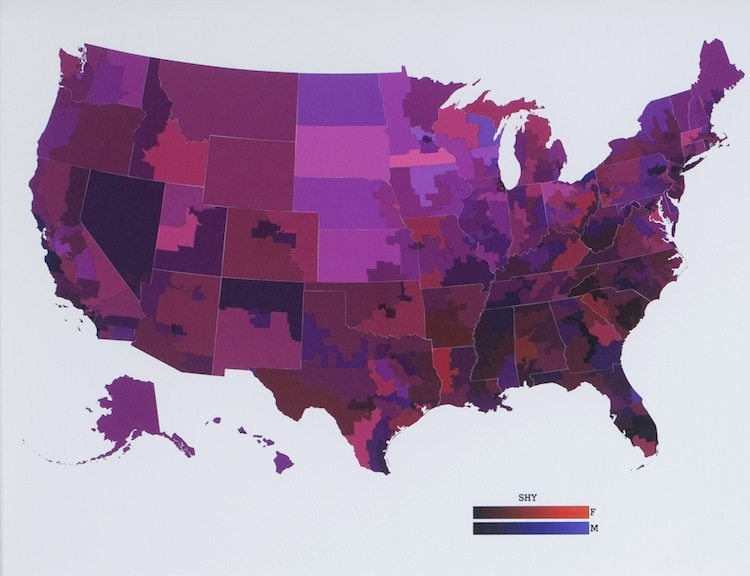 If these maps recall the traditional red and blue political maps we’ve become used to, that’s no coincidence. 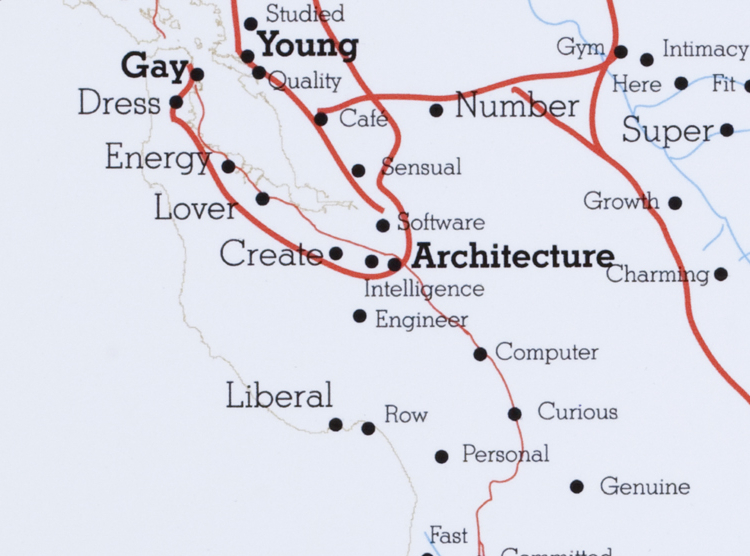 The process started because of work on political maps, as he tells Co.Design: “I tried my hand at online dating briefly in 2008, and became fascinated with the system and how it works. Around the same time, I was planning a sequel for a piece I had done for the Democratic National Convention in 2008 (“Hindsight Is Always 20/20“) that used presidential rhetoric as its basis, so I wanted to make a piece that looked at a different body of text. I decided to switch, if you will, from the sacred to the profane by looking at how ordinary Americans defined themselves.” The project was released in 2010 to coincide with the new Census results. Consider it a sort of shadow census; an examination of how we actually see ourselves and want to be seen by others. What does DuBois think his informal census results were? Mostly that people are far more interesting and original than he thought. “Very few singles profiles are boilerplate. 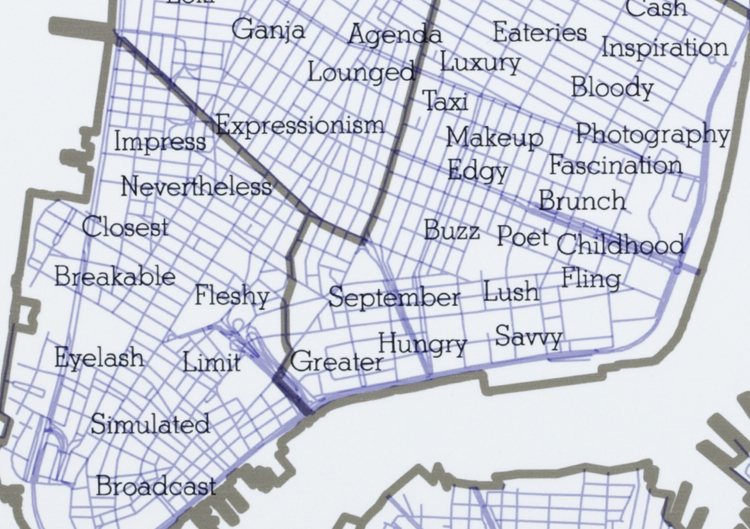 Everyone has a unique way of writing, or as specific activity they write about, or restaurants, or trips they’ve taken.” How the people in Chinatown are distinguishing themselves by using the word “fleshy,” though, is another question.